← Question of the Week for April 26: Where do we come from? 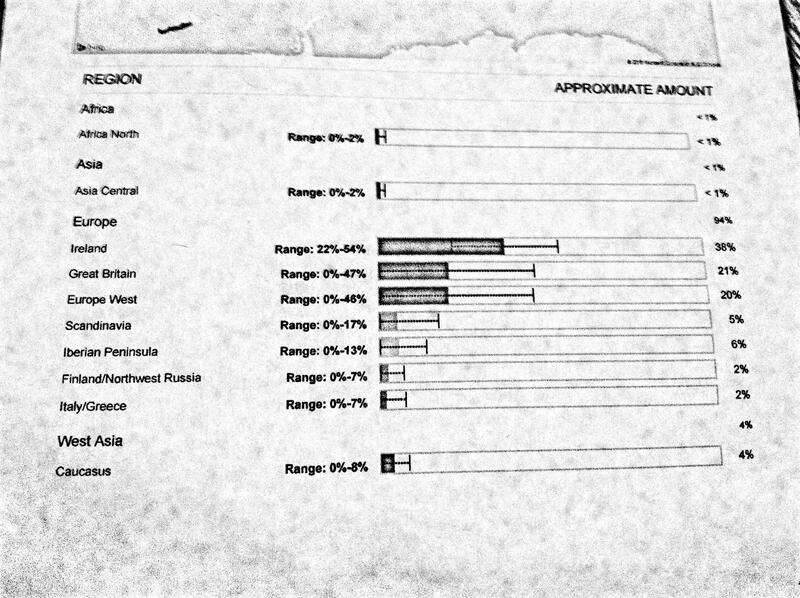 Although I have heard about DNA genealogy reports before, until my brother Paul Cartwright shared the report he received after an analysis of his genome, I have not taken the time to look at one. When I did examine Paul’s “genetic map” report, I was intrigued to discover some things that I did not anticipate. First, let me explain what the report looks like. There is a map of the world and there is a set of percentages, each of which has an aggregate range. One set of circles are what I think most of us would expect: The Republic of Ireland (38%), and the countries of the United Kingdom or “Great Britain” (21%) with the rest of the countries of West Europe (20%). I found it to be no great surprise that there is not much of a genetic contribution from North Africa and Central Asia (less than 1% each). But there are other areas of the genetic map that are not as intuitive. 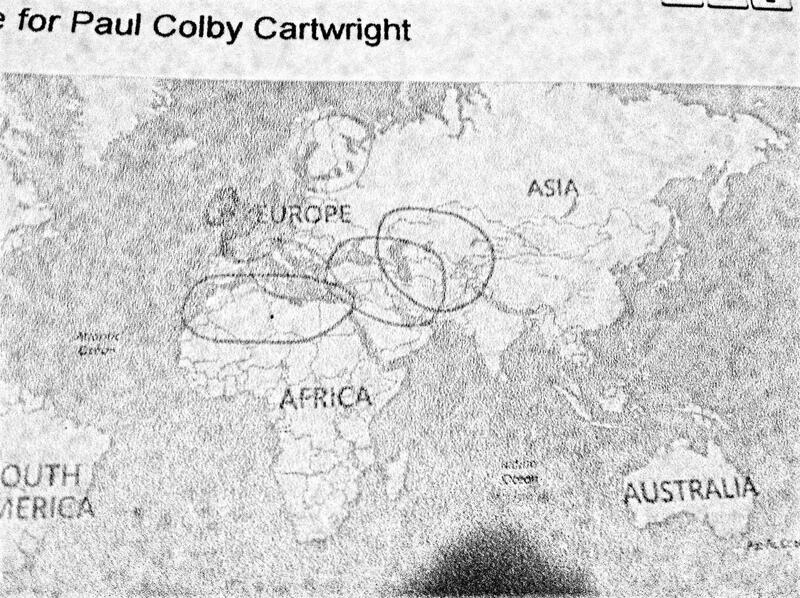 The West Asia (Caucasus) makes up approximately 4% of Paul’s DNA. Does this tell us anything about the family stories about Native American heritage? If so, then this might be an indicator that there is some truth to the stories. Regardless, Millie could not have been a “half-breed” as I have heard it said. Otherwise, the percentage of West Asia (Caucasus) DNA for Paul would be two or three times what it is. So some of the stories that have been passed down about our genetic heritage appear not to be true. On the other hand, this past week, this past week I noticed that Esther Sharon [apparently a distant relative from the Starr family tree] wrote a message to the ancestry.com family tree for Jess and Millie in response to a marriage certificate that Karen Starr Snyder Smith had posted for Hisakiah Starr and his wife Susan Doyel. Ms. Sharon indicated that she believes that Cizaiah Forrester was related to a woman who is known to have been a member of the Chickahominy tribe. I believe she said that her name was Nancy Many Trees. I have to wonder if “Forrester” is a name that this family adopted as they tried to pass from identifying as Native American to being seen as a “white” American. If this person was our ancestor, then the percentages might be a bit closer to being accurate. Paul tells me that one of the things that happens when you receive an Ancestry.com genetic genealogy report is that you receive additional information about persons with whom you share a high percentage of DNA. Paul has already been contacted by someone who was hoping to find additional information to genealogical questions that he has been asking. Paul did not know the answers, but he has corresponded with the person even so. Journalist Christine Kenneally interviewed scientist Wendy Roth about why it is that many people feel compelled to trace their family history back. It is one thing to be an “avid genealogist,” Roth observes, but given the level of commitment required to follow the genetic trail of family origins she wonders what it is that drives people who are interested in “genetic genealogy.” In interview after interview, she discovered that the people she interviewed cannot really give a satisfying answer to her qestion. She concludes: “It’s like it is such an urge or basic primal interest that they have a really hard time putting it into words. . . .” (Invisible History, 26). Kenneally goes on to speculate about the “psychology of family history before she concludes with the simple observation that “the family is a powerful engine of inheritance.” Indeed! I am a member of the senior administrative team at the University of Indianapolis where I have served since 1996. I am married to Mary Wilder Cartwright. We are the parents of four children: Hannah, Erin, James, and Bethany. I currently live in Nashville, IN. This entry was posted in Conversations, Genealogy and tagged Christine Keneally, Cizaiah Forrester, genetic genealogy, Hisakiah Starr, Irish ancestry, Nancy Many Trees, Native American ancestry, Paul Cartwright. Bookmark the permalink. Very good blog…lots of useful information..